Mu is the same character in Namu. Mu looks like a checkerboard with four dots under it. It is an image of men felling a forest, (the semi-circle at the top-left is the radical for cutting). The four dots on the bottom are burning stumps. It means vanishing, defect, want, or negation — a clearing. 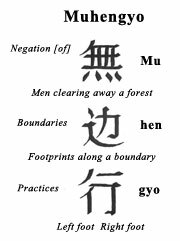 Hen is composed of two characters. On the left and under is the motion of the feet. To the right and above is the character for strength. 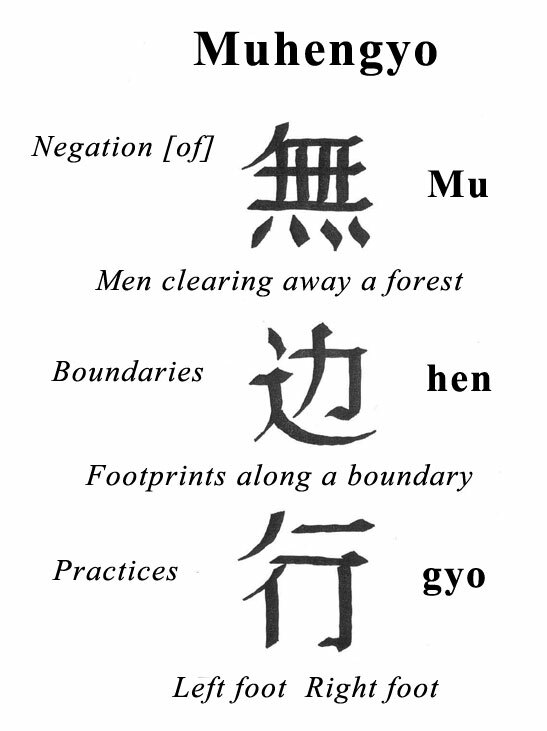 The character for strength, in this case, is a simplification of an older character that combined with the motion of the feet to mean “an edge,” a limit, a boundary, and a border. Muhengyo is the Bodhisattva who constantly clears away all boundaries. Muhengyo is often translated as “Eternity” because he/she cannot be stopped even by the boundaries of death. Muhengyo has all the power of the wind (the wind is not stopped by anything.) He/she also blows away impurities.